The table below lists all 458th Bombardment Group (and subordinate unit's) casualties suffered during the war. Listed are those personnel who were killed in action or accidents, became prisoners of war, were interned in neutral countries, evaded capture, and those who were returned to duty. The 458th lost 305 personnel killed in action or accidents, including accidents not involving aircraft. Of 47 aircraft shot down or otherwise lost due to combat related circumstances, 252 aircrew were killed, 193 became POWs, 34 evaded capture, and 60 were interned by a neutral country, some of these men being returned to England. Additionally, 53 men were killed in accidents, and are listed as "Died, Non-Battle" (DNB). A number of the group’s Liberators made it back to England with dead or wounded aboard. 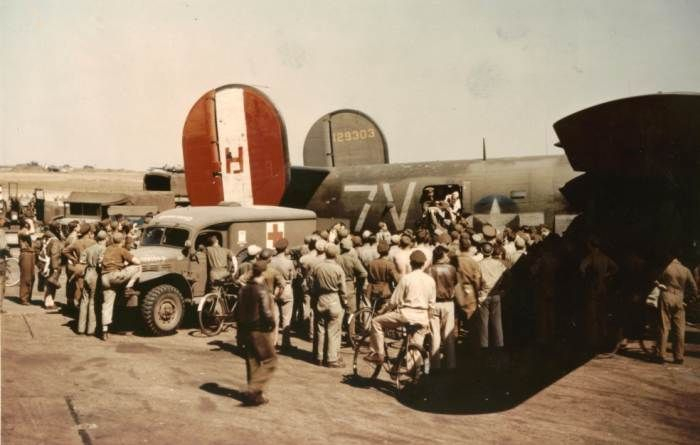 While the men on these aircraft who were KIA are recorded, there is no official record on the number of men wounded in action, so those totals are not included here. Several incidents, resulting either from combat or accidents occurred in which aircrew survived the experience and were back with the group in a short period of time. A number of men were sent to other units or returned to the U.S. Since these names are included on MACRs and Accident Reports, I have classified their status as returned to duty (RTD). Once a name is located in the table below, refer to the “Status” column and then choose one of the seven PDF links listed directly below for more information on an individual casualty.